With only four days remaining until the curtain is drawn on the Octagon’s return to FOX, UFC president Dana White announced their third show on the network will take place May 5th inside IZOD Center in East Rutherford, New Jersey. The breaking news didn’t stop there, as White reported Nate Diaz (Pictured) would face Jim Miller in a critical lightweight affair. However, MMA’s ultimate shot caller didn’t confirm if the 155-pound shootout would serve as the card’s featured attraction. Miller is just four days removed from his comeback submission victory over Melvin Guillard in the organization’s debut on FX. The 28-year-old has won eight of his past nine scraps. Diaz has found new life since dropping back down to the lightweight division. 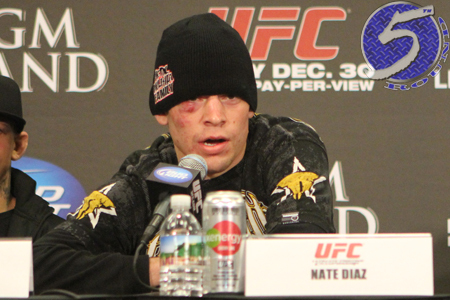 Mr. 209 posted the most impressive win of his career last month by trouncing Donald Cerrone at UFC 141. UFC 128 was the last time the organization hosted an event in Jersey. The March 2011 promotion was held at Prudential Center in Newark. No word if Snooki and Co. will be celebrating Cinco de Mayo with some Octagon action.